Immunogen Synthesized peptide derived from internal of human Oct4. This gene encodes a transcription factor containing a POU homeodomain. This transcription factor plays a role in embryonic development, especially during early embryogenesis, and it is necessary for embryonic stem cell pluripotency. A translocation of this gene with the Ewing's sarcoma gene, t(6;22)(p21;q12), has been linked to tumor formation. Alternative splicing, as well as usage of alternative translation initiation codons, results in multiple isoforms, one of which initiates at a non-AUG (CUG) start codon. Related pseudogenes have been identified on chromosomes 1, 3, 8, 10, and 12. (provided by RefSeq).Tissue specificity: Expressed in developing brain. Highest levels found in specific cell layers of the cortex, the olfactory bulb, the hippocampus and the cerebellum. Low levels of expression in adult tissues. 1. Stem Cells. 2010 May;28(5):885-93. 2. Mol Med. 2010 Jul-Aug;16(7-8):247-53. 3. Med Sci (Paris). 2010 Apr;26(4):411-6. Figure 1: Western blot analysis using Oct4 mouse mAb against NTERA-2 (1) cell lysate. 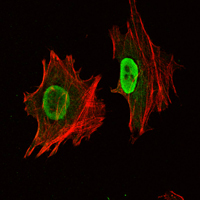 Figure 2: Immunofluorescence analysis of NTERA-2 cells using Oct4 mouse mAb (green). Red: Actin filaments have been labeled with Alexa Fluor-555 phalloidin. 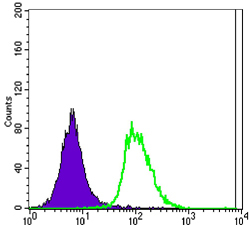 Figure 3: Flow cytometric analysis of Jurkat cells using Oct4 mouse mAb (green) and negative control (purple).